Some time ago (yikes it was nearly 2 years ago! ), I went through my One Man Social Media Empire bag and showed you the kinds of kit I could carry around with me for social reporting. I think it’s time for an update – because a lot has changed. all of these add up to me carrying a very different (and less physically stressful) set of essentials. I still use the famous one man social media empire canvas bag (although I now have two, thanks to Helen) But now the stuff that I have to have for blogging on the road or at events has shrunk down to what you see in the picture plus the N95 that I used to take the picture, naturally. 1. 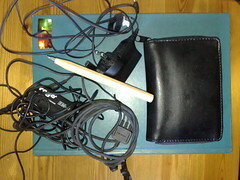 Nokia N95 – this is the powerhouse – it replaces the laptop, minidisk, DV camera and stills camera in the original kit bag. Wow. For once the advertising copy undersells the product – “This is what cameras have become” and this is what computers, and audio recorders have become too. 2. Notebook and pen – I still need to scrawl – it’s still the most efficient method of data capture, regardless of the seeming redundancy of retyping – you don’t retype everything and somethings you only look up once – also sometimes you’re only writing something down in order to keep someone else happy. All that and what I wrote on Creative Choices the other day about longhand. 3. IGO portable bluetooth keyboard – for those times when my thumbs run out of juice – ie anything more than a caption or bunch of tags. If I have to write a paragraph in the field, it’s worth cracking this baby open. It took a little configuration love (and double-checking by @whatleydude) to get it talking to the N95 but it was well worth it. I wish I could say that this whole post was written with it but it wasn’t, because I’m sitting on a comfy chair at home – the post I pointed to above was typed on it though – in Starbucks. 5. External mic and gubbins to connect it to the N95. Unfortunately you can’t just plug a mic straight into the phone and use it. Fortunately, you can buy a couple of adapters for a few quid from Maplin that will connect a mic to the TV-out cable that came with it. A bit cumbersome but very useful in the noisy circumstances in which a social reporter often finds herself. I’ve got an “unlimited” data tariff from O2 and somehow through loyalty and asking the right questions, I get that together with plenty of minutes and texts for £22 a month. Hurrah! I’m waiting for the letter telling me that the unlimited isn’t as unlimited as I thought because I’ve over done it, but it hasn’t come yet, despite some serious goes at it. One of the benefits of the N-series is the wifi which means that I actually don’t upload massive amounts very often – only when it’s vital to get something up immediately, and I’m finding that that’s less frequent than I thought. Although I vaguely understand the difference between EDGE and 3G when they pop up on my phone, it doesn’t bother me much – if I *need* to get online without wifi, then I need to do it regardless of the signal. The other point about this is that it’s so much easier to see whether there’s wifi available with a phone than having to crack the laptop open. So not only has everything got smaller, more portable and easier to use, but the apps on the phone and in the cloud are so much better too. For example, the video editor on the phone means that I can cut stuff, add titles and upload without transferring to a PC at all – for simple stuff this is great, it just cuts a huge amount out of my workload. Using Shozu, I can easily upload to flickr, moblog, phreadz, blip.tv and 12seconds and it handles auto-GPS tagging most of the time. Tweeting through m.twitter.com is fine regardless of connection. I have a bunch of bookmarks in the browser for search terms through search.twitter.com as well as my facebook and flickr. I use the gmail app for mail – again, made even easier with the iGO keyboard. For video that absolutely positively has to be streamed live I have lovely qik of course, though I’m finding that the times when I really need to do this are less than I thought – still for instant interaction it’s fantabulous. Scribe means that I can now blog directly here from my phone (preferably mains powered and with the keyboard) a-may-zing. I need to work out the best way to make all of the content that ends up on the web fit together – what order do I need to do stuff in to make sure that it goes to blip, phreadz, twitter and flickr to get maximum exposure and opportunities for conversation? Also, (gulp) when I’ve managed to optimise that, how do I keep track of it all and take part in whatever conversation arises? How do I get the most out of my battery and what’s the solution, is it spares or portable charging? Scribe is a very early beta it can be a bit flaky – also I need to be able to easily pull in pictures from flickr and generally integrate with my web2.0 bits. Did you say anything else in this post other than is it time to get a mac? I recommend dropping http://m.twitter.com in favour of http://m.slandr.net – the latter being my Twitter Mobile Web App of choice. Many more options available to you. I haven’t look at m.twitter in months. Secondly, given my mobile phone geekiness, folk have often asked me to create a definitive list of the must-have apps. You’ll be amazed at what you might find. Interesting stuff and all without a mac/iphone. PCs are fine (slams bunker hatch). So total cost to me £57.49 (inc VAT) though you could spend more like £350 if you really really wanted to.